Russian new laser, nuclear missile, and underwater drone have been baptized as Peresvet, Burevestnik, and Poseidon. On March 23, during an online vote on the Defense Ministry’s website, the Russian public chose the name of the new weapon systems President Vladimir Putin presented on the first day of spring. They are: A laser weapon, an underwater drone, and a cruise missile with unlimited flight range. “We have begun the development of these new types of strategic weapons, which do not use ballistic flight trajectories at all when moving towards their targets, meaning that air defense systems will be useless and meaningless against them,” announced Putin, revealing to the country and the world the new cruise missile with a nuclear energy installation that can endlessly fly around the world. Former military analyst from the Izvestia newspaper Dmitry Safonov said the missile resembles the Russian X-101 and the famous American Tomahawk. “However, inside the Russian projectile there’s a small heavy-duty nuclear energy installation that increases the weapon’s flight range many times over (the striking ranges of the Tomahawk and the X-101 are 2,500 and 5,000 km, respectively),” noted the analyst. It’s also low flying and unobtrusive. Basically, it will travel to its target at supersonic speed, skirting landscapes making it almost impossible for anti-missile defense systems to pick it up. “Since the distance (of the flight) is not limited, it can manoeuvre for as long as it wants. As you know, no one in the world has anything similar. Sooner or later, perhaps, they will, but in the meantime our guys have invented something else,” Putin said. This is a new underwater drone that can navigate the oceans for an unlimited period of time thanks to the same type of nuclear energy installation. According to the president, this will be a noiseless robot that will be able to move towards its target along the bottom of the ocean. “It can navigate at a very significant depth and it can travel intercontinental distances at a speed that greatly exceeds submarines, the most modern torpedoes, and all the fastest types of ships,” added Putin. He stressed during his presentation that today no weapon in the world can eliminate the threat of such a system. Experts believe that Poseidon is a result of research carried out on the Status-6 projects, which develops underwater weapons of mass destruction. “Supposedly, this is a development from the Soviet project – the underwater robot must unnoticeably place a cobalt bomb on the opponent’s shores. Its explosion would create a tsunami that can erase a megalopolis from the face of the earth in one instant,” military expert from TASS Victor Litovkin told Russian Beyond. In his words, the consequences of an explosion of a cobalt bomb are similar to those of a nuclear warhead: Hundreds of km from the epicenter of the explosion the earth becomes radioactive. 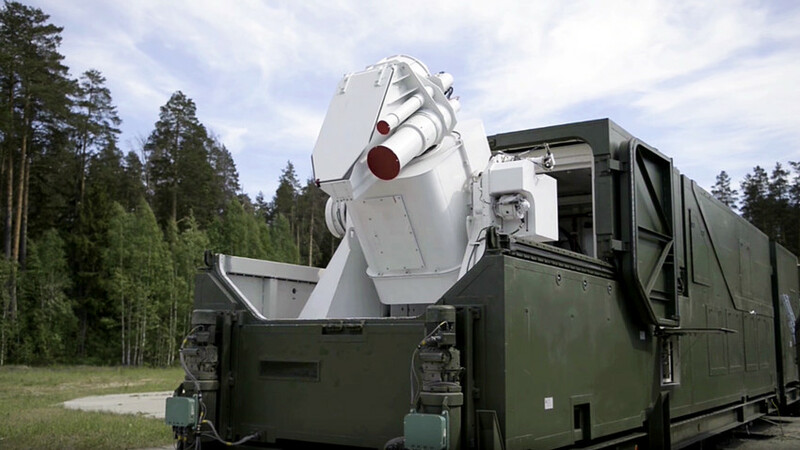 This is the Russian version of the laser weapon that American forces are currently testing. Neither the president nor the military are divulging the possibilities of this system and Russia’s first laser is still shrouded in mystery. “Substantial results have already been obtained in the creation of the laser weapon, meaning that this is not just an idea or a project, not just the beginning of production. Military laser systems have been entering the armed forces since last year. I don’t want to go into details right now, it’s not the right time. But experts will understand that the presence of these combat systems greatly expands Russia’s security potential,” added Putin during his presentation.